As populations shifted and synagogues and older Jewish organizations closed, many memorial plaques were abandoned or stored in poor conditions. 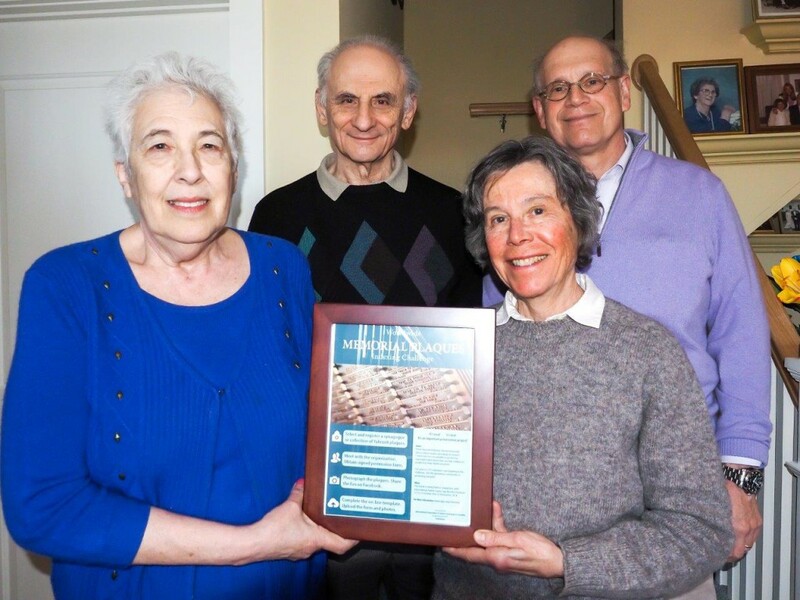 Over the past six years, a small team of JGSGB’s volunteers has collected, photographed, translated, and transcribed the content of each plaque from 65 synagogues and Jewish organizations in Massachusetts. They submit the information to a central online database, creating a virtual archive of these endangered materials as well as plaques that are not endangered. 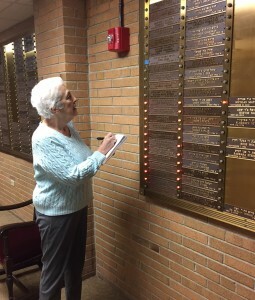 A team of JGSGB volunteers, led by Carol Clingan and David Rosen, began to photograph, translate and transcribe the memorial plaques across the state to make the data available to researchers worldwide through the JewishGen Memorial Plaques Database. The JGSGB Memorial Plaques Team (L to R): Carol Clingan, David Rosen, Sue Rosenstrauch and Al Bernstein. The American Jewish Historical Society poster promotes the Memorial Plaques Project. The typical plaque contains the individual’s Hebrew name and his/her father’s Hebrew name. When both appear, they may reveal two generations, since Hebrew names traditionally include the father’s name (patronymic). Plaques that memorialize parents, earlier generations, Holocaust victims, and others who died in Europe may also contain unique or previously unknown information that can open new avenues for research. A plaque may show the spelling of surnames and dates of death, occupations and affiliations, and where the deceased or descendants lived. The 40,396 plaques from 65 synagogue and institutions that have been indexed represent a significant portion of the plaques that exist across Massachusetts. Another 30,000 have been photographed and await translation and transcription. A handful of other known sites have yet to be visited. 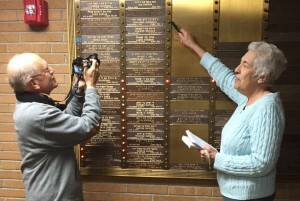 When the Orange Street Shul in Chelsea (Congregation Shaare Zion) closed its doors in 1999, members of the JGSGB found hundreds of unclaimed memorial plaques. Chelsea, a small city near Boston, had been home to an important Jewish immigrant community that included the family of Warren Blatt, JGSGB’s Vice President at the time. The Orange Street Shul was their synagogue. Warren discovered memorial plaques for ancestors in Europe who had never come to the United States. The plaques provided important information because they were the only records he had for these individuals. JGSGB members photographed all the plaques and translated the Hebrew inscriptions to English. JGSGB created a new database for Memorial Plaques containing the English and Hebrew names of the deceased, their Hebrew and English dates of death, and the Hebrew names of their fathers. After publishing in the JGSGB journal, Mass-Pocha, Warren submitted the database to JewishGen, where it became a precursor to today’s JewishGen Memorial Plaques Database. Sixteen years later, the JGSGB is recovering vital information from memorial plaques across Massachusetts. Beginning in 2008, the JGSGB began an exhaustive search to identify every synagogue that ever existed in Massachusetts and to locate any remaining records. Over the course of a year, member Carol Clingan discovered 568 synagogues that are currently in operation or once existed. See the list on JGSGB’s website. JGSGB’s exhaustive 2009 survey of past and present synagogues throughout Massachusetts identified collections of memorial plaques and previously little-known locations of those from synagogues that had closed or merged. It began with one of the project leaders initiating contact with synagogues to explain the project’s significance and to make an appointment to visit. Priority was given to synagogues with older and/or relocated memorial plaques. The team of a researcher and photographer visits and assesses the sites. The photographers have been trained in dealing with difficult lighting situations. They carry auxiliary lighting and ladders to be able to produce the highest-quality photos. They assign each plaque a unique number and note its exact location. Photographs of plaques are carefully analyzed and recorded. They translate the Hebrew and transcribe the Hebrew and English content onto a spreadsheet that conforms to a template provided by JewishGen. They double check all entries for accuracy against the photographs before they are submitted to JewishGen. The project originally focused on memorial plaques dating from the immigration era, cataloging locations that had plaques from defunct synagogues. This was done to help researchers who have no reason to know that these records exist or where to find them. Next, very old synagogues were included because they were most likely to have memorials for congregants’ parents from Europe and other locations in the diaspora. Finally, as it nears the conclusion of work in immigrant-era synagogues, the project has recently expanded to congregations founded in the ‘20s, ‘30s and beyond, including postwar congregations. The New England Hebrew Academy, a Yeshiva that moved from the old Jewish neighborhood in Dorchester to a newer one in Brookline, had memorial plaques from New England Hebrew Academy has plaques from eight former synagogues in the Dorchester and Roxbury neighborhoods of Boston, and the neighboring city of Chelsea. These three communities were among the Jewish population centers during the immigrant era. The Beth El Free Loan Society of Dorchester and the Dorchester and Mattapan Hebrew Schools were the original homes of memorial plaques found in a synagogue in Hyde Park, another Boston neighborhood. The Jewish Health Center in Worcester, MA, a successor of the Hebrew Home for the Aged and Orphans, founded in 1912, had 2,100 memorial plaques that were never in synagogues and apparently were put up as a long-term source of funds. A local Rabbi brought these plaques to the Society’s attention.